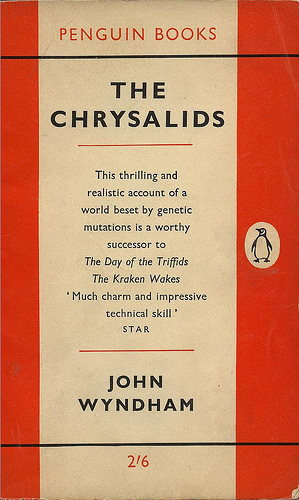 If you know where The Fringes are and who lives there, you're probably a John Wyndham fan. I became one in early adolescence, when my father handed me a battered Penguin copy of The Chrysalids from his own bookshelf. I swallowed it whole, and read it several times more in the next few years, along with The Day of the Triffids, The Midwich Cuckoos and The Kraken Wakes. It's a marvellous book, guarranteed to appeal to adolescents going through that "why am I so different to everyone else?/I must be adopted" stage. You can find a detailed plot summary here. All you need to know for present purposes is that The Chrysalids is set in post-apocalyptic Labrador. Here, a small group of survivors adhere to a harsh fundamentalist doctrine that sees transgressors exiled to - yes - The Fringes. And it all it takes to be cast out is to be revealed as deviant from a tightly defined genetic normality. Ten-year-old David is the son of a pious and powerful patriarch. He therefore keeps quiet about his strange recurring dreams of a beautiful lighted city and horseless carriages. However, he and a few other young people discover they are carrying their own blasphemous deviation - the ability to read each other's minds. Soon, they are forced to flee to The Fringes themselves. Eventually the group is rescued - by a woman who contacts them telepathically from a far-off place called Sealand. When they reach it, David recognises the place of his dreams. My father told me this place was New Zealand. As we were still living in England and I knew nothing of parental plans to emigrate, this was of little interest to me. What made it of complusive interest was that I was a deviant myself. 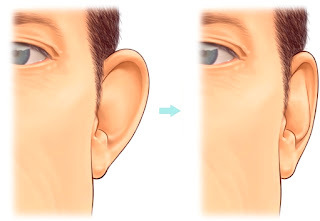 The medical diagnosis is that my right ear lacks the usual cartilege folds, which means it's shapeless and prominent, like the one on the left. I quite forgot the thing that I hated more, the thing that lay behind my dislike of any attention paid to my hair: how heartlessly a ponytail revealed my deformity. I wasn't teased or bullied about my ear, but, from the day I changed from plaits, which hid the ear, to my ponytail, I was subject to helpful observations along the lines of "Your ear sticks out", and innocent inquiries, like "Why does your ear stick out?" My mother had asked herself the same thing. Apparently I spent the first few weeks of life with the offending ear sticking-plastered to my head. Until some medico pointed out that this was never going to fix it, that it would take an operation to do so. Someone - perhaps the same health provider - told my mother there was no point doing this before I was 14, since it might just revert. But when I got to 14 and 15 and 16, my ear was the last thing anyone was thinking about. Instead, we emigrated en famille to New Zealand. Only on bad days does it seem like The Fringes; mostly, it lives up to the promise of Sealand. This was not the first science fiction I read as a child, but it was close! I shivered the first time David saw Sophie's footprint, and the ending is fantastic! Does the lack of cartilage folds affect your hearing on that side? I know if one cups a hand behind the ear, it helps to catch sound, so the lack of folds would seem likely to affect your hearing. And I should fess up, I suppose - I had an enemy at school: she hated me because I wore glasses, started class mid-term and had divorced parents (bigger thing in the early 60s!0; I hated her because she hated me. And the only thing I could do to get my revenge on her was to mock her sticky-out ears. Thankfully, this wasn't you! My deformed ear is more "cupped" than the normal one, which is flatter against my head. So maybe it collects sound more, not less, effectively. I dunno!